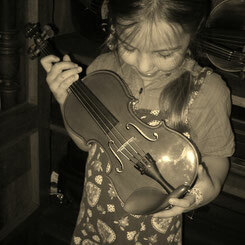 What is the most important thing for a child sized instrument? Of course it has to respond well and produce a nice sound. Still it should be an instrument that is good value for money. So we choose nicely build instruments as a base. What is probably even more important: We raise the quality of our instruments with a sound adjustment, that we developed especially to the needs of children. All our instruments for beginners respond easily and sound nice. They are also lightweight and have a correctly shaped neck. 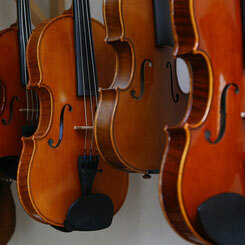 €20.- per month including case and bow - plus €1,- per month if a shoulder rest is required. €690.- for second hand violin with bow and case. These instruments are checked in our workshop and brought back to their original standard. €750.- for a new violin with case and bow. €22.- per month including case and bow - plus €1.- per month if shoulder rest is required. €790.- for second hand viola with bow and case. €35,- per month including bag and bow. €1550.- to €1700.- (depending on size) for second hand cello with bag and bow. These instruments are checked in our workshop and brought back to their original standard. 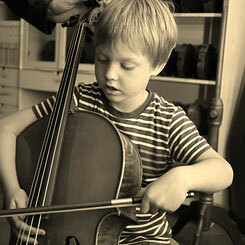 €1800.- to €1950.- (depending on size) for a new cello with bag and bow . Some children learn very quickly, so they might need an instrument that is still childsize but allows them to form the sound. To these children we can offer our higher quality range of instruments: For these instruments qualified makers spent some extra time on arching and hollowing to create a better sound. The Konzert-Modell is not just a smaller adult instrument, but a special design that reduces the disadvantages caused be the lack of size. And of course, we give the Konzert-Modell a makeover in our workshop. We think, the Konzert-Modell instruments are the best sounding childsized instruments we have ever heard!